In a world now ruled by social media, it’s easy to crop and filter and carefully choose which photos see the light of day. I became really good at skipping over the ones that were bad and after awhile I stopped really seeing what I looked like. I think I started to really pay attention and put my brain on the track to wanting to make a change during the second half of 2016. I knew whatever I’d been doing (read: not much) wasn’t working and I wanted to change. But I am not someone who makes fast changes. I need to think, analyze, and think some more before I make any decisions. I had heard about the 21 day fix from a friend at work who had done it and I vaguely paid attention to some people in my Facebook feed who were Beachbody coaches. I’d looked up the general premise of the program. But other than that, I didn’t pay much attention to it. I took classes at local gyms, but going by myself often made me anxious having to work out in a close proximity to people I didn’t know. And then I’d stop going and I’d get even more anxious about going back after a hiatus and so would go the cycle of going and not going to the gym. I had a coworker ask me recently what the “tipping point” was for me in terms of deciding I wanted to make a change. And while I don’t know I had a clear “moment” I do know that I had several moments during the fall where I saw photos of myself and thought, “Wow. That’s what I look like?” I sat at the airport after a trip with my high school girlfriends looking up apps to try and make me look thinner. Those photos never made it on Facebook. I looked at photos from a wedding I had been in during the fall and winced at a few. Were there a lot of flattering photos of me from that day? Sure. Did I post the cropped, perfectly angled ones on my Facebook and Instagram accounts? Absolutely. And so it went. The holidays came and went and I filed away the photos where I wasn’t standing up totally straight and sucking in my stomach. The inevitable New Year’s resolution time was upon us. A friend of mine from high school who is a coach for Beachbody posted about a new year’s workout plan special and that was it. I asked for details and within days was signed up for a streaming workout account from Beachbody and the 21 Day Fix portion control eating plan and was added to a Facebook accountability “challenge” group. I had no idea what I was doing. And for once in my life, I didn’t spend a ton of time researching reasons why I shouldn’t do it. I did spend days scouring recipes and making spreadsheets planning what and when I would eat and not once did I try to look up anything negative about the program I’d chosen. My portion control containers arrived and I remember thinking, “Yikes. That’s a carb serving?” My food intake was suddenly in sharp perspective. But I was armed with an arsenal of recipes, a list of the foods I was allowed to eat and off I went to the grocery store. I came home with bags full of organic this and natural that, containers of nonfat Greek yogurt and piles of fresh fruit and vegetables. The main thing I remember about those first few weeks of January is that it was cold and dark. I decided I was going to workout in the morning before work and set up our office with my workout equipment and figured out how to set my laptop up to stream the workouts on the TV. I laid out all of my workout clothes and off I went on my three-week journey. Three days in, I could barely walk. Every day I had to check in to the Facebook group and log what I ate, how long I’d slept the night before, how much water I’d drank and a few goals for the next day. Rinse, repeat. There were so many days that I wanted to chew my arm off during the day and just kept drinking water. I was eating five times a day but I wanted sugar. I wanted carbs. My system was a mess for weeks while I adjusted to a new diet. I was super bloated. I snacked on veggies while I cooked dinner to curb the urge to snack and soda water with lemon saved my urge to drink wine. Frozen bananas with natural peanut butter were my dessert substitute. I concentrated on the things I could eat and focused on that. I could drink wine a few times a week if I wanted to but I was worried that if I had a glass, I’d want four. Because who stops at a 4 ounce glass of wine? So I didn’t drink much at first. But every Monday, I’d get on the scale and I’d be down a few pounds. I looked forward to checking in with my Facebook group and knowing that I was accountable to a group of people helped me stay on track. Twenty-one days came and went and I was down 8.5 pounds and 7.5 inches. I started another round of the Fix and then started a new Beachbody workout program, sticking with the 21DF meal plan. And eventually, I had days where I rarely thought about wanting carbs (not every day, let’s not get ahead of ourselves). I’d wake up before my alarm went off to work out. Even on cold and rainy days, I was plugging away at my workouts. I went from barely being able to hold a plank for ten seconds to holding one for a full minute. And every week I’d see a smaller number on the scale, hitting milestones I hadn’t seen in years. I went from wondering if I was ever going to see a change to seeing and feeling a change. I felt better, I was sleeping better, I was climbing stairs and not getting winded and then one day I was no longer fitting in to 3/4 of the clothes in my closet. By mid-March I was down another ten pounds. I could spend a lot more time detailing how tough it was. But I can honestly say I don’t think there was a day that I thought about quitting. I had people I’d gotten to know through my Facebook accountability group. It was funny how I felt more tied to people in an online group, some of whom I’d ever met, than anyone I ever encountered at the gym. There were other things going on in my life that were challenging during the first half of the year and this gave me something positive to focus on. I have a supportive partner who I’m sure groaned internally the first few times I made whole wheat pasta or quinoa but he never complained. He drew the line at sweet potatoes though. I think the fact that we spent a lot of the first few months of the year to ourselves helped me somewhat. My husband and I spent a lot of time at home, eating meals in and generally being non-social. That dark time of winter doesn’t last forever, and the time comes when the days get a little longer and the calendar starts to fill up, regardless of whatever personal challenges you’re facing. I attended social events, went out with friends, had family parties, and had to make choices about what I was eating and drinking. I started making different decisions. I brought sparkling water and organic popcorn to the movies. I’d bring my own grilled chicken to my staff meeting lunches where we were served chicken finger salad. I’d drink wine when we’d go out to dinner, but I’d switch out every other glass for soda water. Half as many glasses of wine would get me twice as tipsy. After a few months, some foods didn’t even appeal to me. I snuck some movie popcorn when out with friends and it tasted like plastic. Do I still like my snacks? Sure. Can I turn down Dairy Queen ice cream cake at my niece’s birthday party? Heck no. But, I (try to) do it in moderation. And I am still struggling with that. Sometimes my eyes win out over my stomach and I kill a box and a half of wine and two bags of chips with my girlfriends. I’m human. But – I know that if I have a bad day, I shake it off and do better the next day. When I started this post, I thought I was going to cover a lot more ground but somehow, I’ve punched out 1900 words and it’s probably time to stop for now. I could probably sit and rewrite this fifty times. As you can see, the title of this post only marginally has to do with it’s contents. I thought I’d be talking a bit more about my wardrobe transformation as well. 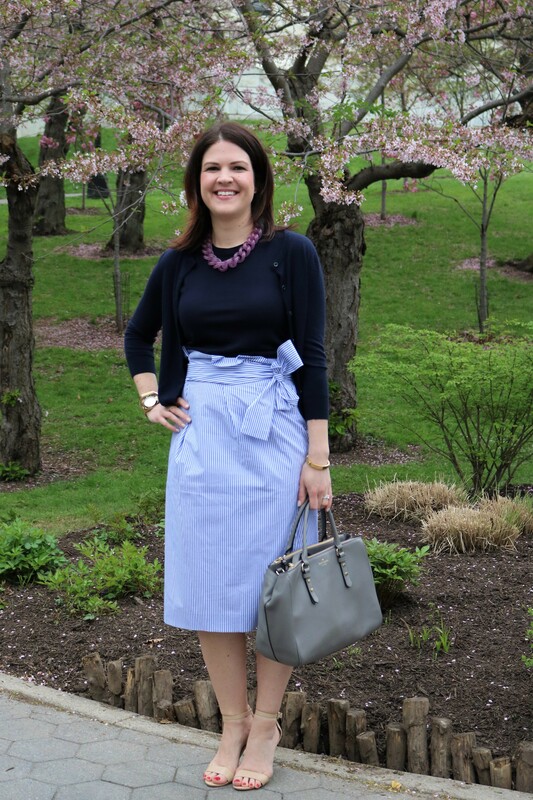 I am wearing a tie-waist skirt in the last photo, taken this April at the cherry blossom festival in Buffalo, NY. So I’ll leave it there and I’ll tell you about what I did with all those clothes on another day. I welcome any questions or comments and any suggestions for things you’d like to hear more about. If you’d rather reach out to me via email, drop me a line at fablifeforever@gmail.com. Thanks for stopping by. You are making such great progress Anne!! I know how exactly how you feel as I am going through the same weight loss journey. This journey is really one meal at a time. Congratulations Anne, I am so happy for you. IMO you looked wonderful even before you started but your happiness comes across in your “after” photo. Making positive changes in your life that you can stick to is much better than a regimented plan with no flexibility. Integrating exercise and good eating plans but still living your life makes continued success possible. I struggle at mid-life trying to find a way to do this knowing the changes I make now really will make a difference later on when it comes to dealing with aging but it’s hard and the problems of work and life often make it harder. Thank you for sharing with everyone, best wishes for continued success even if it is a box of wine with some extra exercise the next day, it’s all about moderation! Hey Anne! It’s Sheryl (girlytang) from Instagram. I am so proud of you!!!! Thank you for sharing your journey with such candor. You are such an inspiration. Honestly I always considered you as being fit. You do have great symmetric proportions. That said the before and after pics tell the tale! Those abs and that thigh gap! lol I lost over 100 when in my early 20s. I have kept it off more or least for 20 years. I was never perfect even after weight loss, but I transformed to the point that classmates and family friends did not recognize me. I really want to get back to devoting time to be my best self. I’m not overweight now but there are certain areas that are not as toned as they once were. With life being very busy and with so many commitments, I see the potential for a slippery slope. Thank you for inspiring me to get back at it. Applause & Hugs!!!! !